When comparing the .243 vs the .270, we are looking at two well-known and popular rounds that overlap in their shooting applications. While there is overlap, there are areas where one cartridge is going to be better suited than the other. That’s what we have set out to look at in this article rather than try to crown one cartridge as better than the other. In this article, we are going to look at several of the most popular factory loads for each of these cartridges. And yes, we know and are fully aware that handloading your own brass can impact the ballistic and other performance properties that we will outline below. While we would love to cover other bullet designs, casings, and powders, we just don’t have the room to do so. And besides, there are still plenty of us who take factory loads out into the field. The .243 is often referred to as the baby brother of the .308 Win. The .243 Win is a necked down version of the .308 Win and was introduced to the shooting world in 1955. What this cartridge offered was a long range hunting round that was able to take lighter bullets that were more suitable for target shooting and varmint hunting. The .243 was and still is a popular round in the United States, and its emergence into the shooting gave hunters a very versatile round that could be used in a variety of hunting situations. There is a range of bullet weight options for the .243 Win. These can range from 55 to 115gr, though most hunting cartridges top out at the 100gr weight. The .243 Winchester also has a lot of history in the long range shooting world. It might not be as prevalent as it once was, but the .243 is still seen in use today in these shooting circles and it is still winning a lot of competitions. Of course, we are only looking at factory loads, but it still gives you an indication of this cartridges capabilities. The .270 Winchester was introduced in 1925 where it would stay in relative obscurity for a time. The .270 Win was developed from the .30-03 casing which many popular cartridges have been derived from. This cartridge was also one of the first few cartridges available to the public that could break the 3,000fps mark. The famous firearm and outdoor writer, Jack O’Connor, championed and pushed this caliber and its abilities in the field and brought it to the forefront of hunting calibers, where it remains to this day. The .270 has gained a huge following in the world of hunting from small varmints and predators to large American game such as sheep and deer. With a leap in bullet technology, the .270 is much better suited for taking larger game such as elk where the .243 is not suitable. As far as bullet weights go with the .270, most ammunition is going to fall between 120-160. There are smaller weights that are available for small game. Like the .243, there is a lot of options regarding bullet weight and design, and they are readily available and affordable. We can see some pretty significant differences when we look at the cartridge specs of the .243 vs the .270. Obviously, the .270 is a larger caliber than the .243 and the overall cartridge length for the .270 is nearly slightly over a ½” longer than the .243. As we would assume from these differences, the .270 can hold a good deal more powder than the .243 which is needed to bring the heavier bullets up to a proper speed for shooting purposes. We will take a look and see how these differences in case design and applicable bullet weights change the way these two cartridges behave in the field. Below we have listed five popular hunting and target rounds for each cartridge. This is by no means a comprehensive list of the available options, but because they are popular and used heavily and we think it covers a lot of the popular grain weights and styles, it will give us an accurate depiction of how these cartridges stack up against each other in the ballistics and other performance compartments. There are a few points that we want to point out before we really dive into the comparisons. The first is that we understand we are only scratching the surface of the amount of round options that are available for these two cartridges. Our picks do not mean that we think other rounds do not deserve to be a part of the discussion. From a standpoint of brevity and clarity, adding more rounds to graph and discuss would really muddle everything up and make the article difficult to move through. This isn’t a peer reviewed research paper. We take being accurate seriously but we also want a product that is going to be clear and concise. We do realize that using such a small sample size can sometimes be inaccurate when relating to the full set of factory load options of these two cartridges. To compensate for clear and concise and accurate representation, we actually compiled a lot more rounds for each cartridge. At the end of each section, we will present averages of the larger data sets for each cartridge. By doing this, you get more information, we get a better picture of how these two cartridges compare, and the article will still be easy to navigate through. It’s a win, win, win solution. Finally, we also want to point out that we are using computer-generated data. 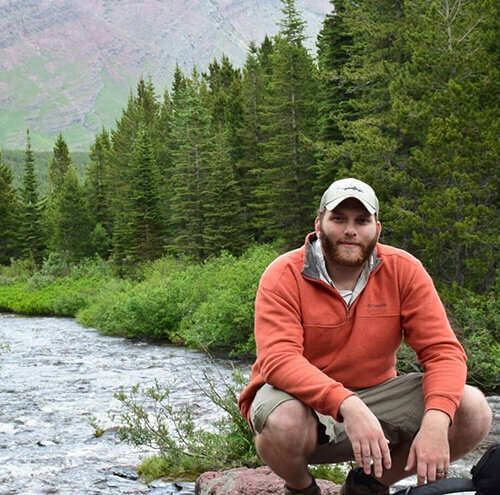 We will be the first ones to admit that nothing compares to hard field data, but the truth is, a lot of us just don’t have the time and/or resources to compile that amount of data. While computer-generated data has its drawbacks, it can still be incredibly useful and informative. We have compiled the data from the manufacturers and also calculated a lot of the data on our own. While the numbers we show can vary by small amounts, we can control for a lot of variables we wouldn’t be able to with field tests. And for trying to compare something as broad as two cartridges, its one of the most effective means. Before we jump into the various categories for which we will be comparing these two rounds, it’s important to note that slight changes to certain variables can impact their performance. We will make it clear what these variables are as we move through the article. When comparing two cartridges, the topic of kick or recoil is bound to come up in the argument. For most experienced hunters and shooters, recoil takes more of a backseat to other performance specs, but it is still a category to consider and discuss. Recoil can throw off a shot, especially for younger or more inexperienced shooters who are thinking about the kick as they squeeze the trigger. This flinching is a huge contributor to missed shots early in one’s shooting and hunting journey. Not only that, but a decent amount of recoil is going to make follow up shots much slower as you must re-center and take aim again. A few lbs of force difference can be the deciding factor in squeezing off a second and successful shot on a spooked animal. For these reasons, we felt it was important to take a look at the recoil produced by these two cartridges. We want to note that what we will be looking at is the actual recoil energy (ft.lbs) generated by firing these cartridges. This is not the actual “felt recoil” or the kick that you will notice when firing. Felt recoil is going to depend a lot of your shooting technique as well as firearm characteristics such as weight and stock design. Still, force generated still translates to felt recoil to some extent, especially when keeping the variables consistent as we have done here. 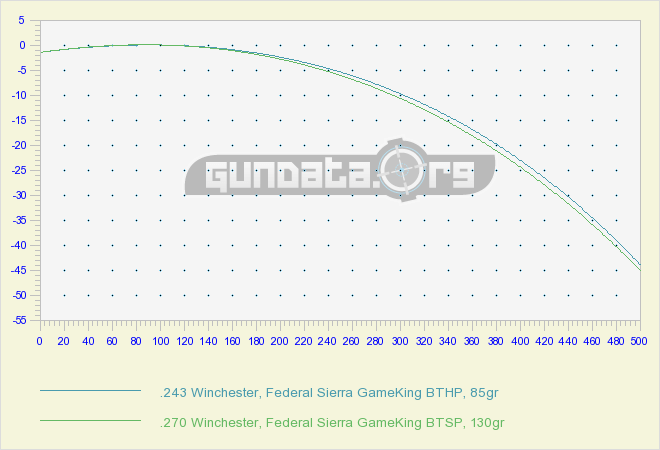 Before we take a look at our ten selected rounds, let’s just look at a general comparison of these two cartridges fired from a 7lb rifle (Graph 1). We see that the .243 Win produces a fair amount less recoil than the .270. Though, when thinking at a broader level, both of these cartridges have far less recoil than other common hunting and long-range competition shooting cartridges available. Though a general statement, you will often hear that 20ft.lb of recoil generated is high enough to have the chance to impact your shot for even experienced marksman, especially if you are not familiar with the firearm and cartridge. This varies from person to person but gives you an idea of where these two cartridges stand regarding affecting your shot. 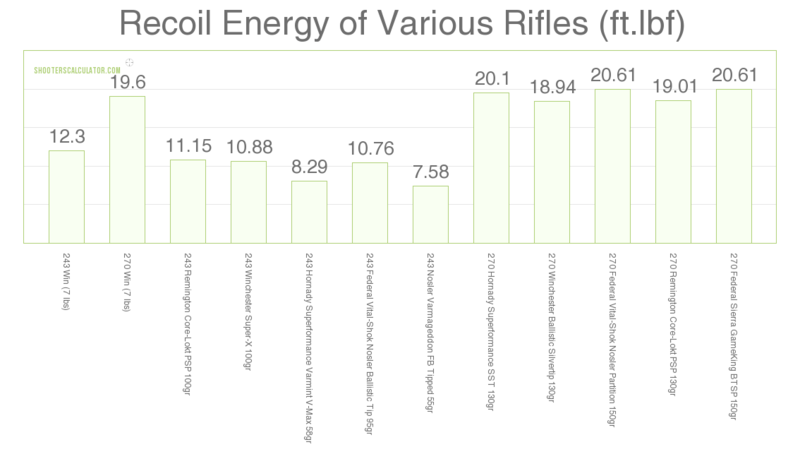 Let’s go a bit narrower and take a look at the generated recoil energy of the ten rounds we have selected for this cartridge comparison (Graph 2). We are still using a 7lb firearm, and we have selected a common powder load that is kept constant for each round within each cartridge and was selected from the average weights of the bullets for each cartridge. This data can change by increasing or decreasing the amount of powder, but we feel it is safe for comparison since manufacturers do not max out the amount of powder the casing could hold. We see from this graph that there is a very distinct difference of recoil generated from these two cartridges. The .270 Win rounds all produce recoil energy over 17ft.lb while none of the .243 Win rounds reach over 12ft.lb. If we look back at the cartridge specs from earlier in the article, most could have guessed that this would be the case without needing a graph. More powder and heavier bullets are going to lead to more recoil. If you are just picking based on recoil, the .243 appears much easier to shoot and much easier to pop off accurate successive shots than the .270. As is the case with any cartridge comparison, less recoil often means a tradeoff with other ballistic categories which we will investigate next. We definitely see a distinct difference between these two cartridges when it comes to recoil energy so let’s take a look at the average recoil when we bring in more rounds to the mix. Like with the smaller data set, the .270 Win rounds are producing a much greater amount of recoil energy than the .243 Win, on average. With a little over 8ft.lbs of recoil energy, you will definitely be able to tell a difference when shooting these two cartridges. We also see that this difference is not just due to some outliers, but there is a distinct difference between all of the .270 and .243 rounds. While you are going to be able to tell a difference in shooting these two cartridges, the .270 Win still produces a little under 20ft.lbs of recoil. Is this difference enough to make shots easier with the .243? For most. we would bet that both of these cartridges can be shot with relative ease, but it might not be the case for everyone. Any serious marksman and shooter are going to be well aware of how their cartridge of choice is going to behave once it leaves the barrel. 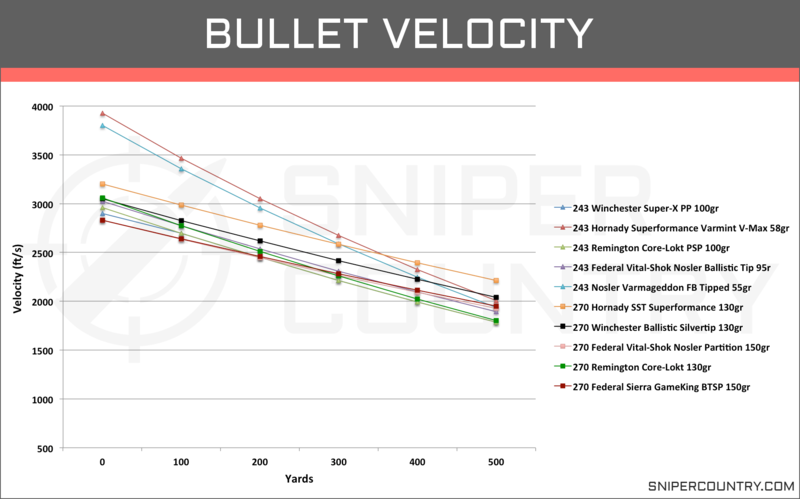 Velocity, ballistic coefficient, and trajectory all play a major role in how accurate and how well the bullet will bring down game. By looking at these categories, we can begin to determine in which situations one or both of these cartridges are well suited for. Whether you hunt or participate in distance shooting or a little of both, you know that velocity is a key factor in a bullets effectiveness. The higher the velocity, the more penetration and expansion you are apt to get, which is important for hunting purposes. Higher velocity, paired with the correct twist rate in your barrel, makes the bullets less susceptible to environmental influences which can make calculating long range shots in windy conditions less difficult. A lot of shooters get a little overboard with velocity. There is a fine line between a hot load that improves terminal ballistic properties and a load that pushes the envelope of safety and bullet stability in the air. With factory loads, the latter is hardly ever an issue, but be aware when handloading that as much extra ft/s you can tack on is not always beneficial. Let’s take a look at our ten selected rounds and see how their velocities (ft/s) compare to one another. Data was compiled from the manufacturer’s websites and tested from a 24″ barrel when listed (Graph 3). When we look at these rounds, it appears to be all over the place right out of the muzzle. All of these rounds are pretty hot, especially the low weight (55 and 58gr) .243 rounds that have a muzzle velocity of nearly 4,000ft/s. Though hot, you will notice that with how light these bullets are and the small ballistic coefficient, which we will get to shortly, they bleed off speed rapidly. When looking at the heavier rounds (95+), we see that they are much more clustered from muzzle to 500 yards and are also more similar to the .270 Win rounds. When looking at these rounds that cluster near the center of the graph, we see that there is quite a bit of overlap between the rounds of both cartridges. The averages do give the slight edge in velocity to the .270 Win when not including the sub 60 grain .243 Win rounds. We also see that all of these rounds remain supersonic through the 500 yard mark with all of the hovering around the 2,000fps mark. We will take a look at the limits of supersonic flight between these two cartridges shortly. Let’s take a look at the average velocities of these cartridges after bringing in more rounds of each. We should also briefly discuss the light .243 Win rounds. There are three .243 Win rounds that fall below the 60gr mark and it would not be unwise to question how much influence these rounds have on the averages above. And they certainly do in this case giving the .243 Win the advantage in velocity. We keep them in for the averages because we want to look at a cartridge comparison and they are .243 rounds. Even so, we understand how they can skew the data if not careful. With the lighter rounds included, the .243 Win has anywhere from 100 to a little over 200 more fps throughout the first 300 yards of the bullet’s flight, though, like the smaller sample size, we do see the .243 bleed off velocity at a higher rate and we see the .270 Win actually outperform the .243 in terms of velocity at the 400 and 500 yard range. If we take out the lighter rounds, we still see an overall higher velocity for the .243 Win over the .270 Win from the muzzle to 300 yards, though it is much reduced. At the muzzle, the .243 Win velocity falls to 3,073fps, only a little over a hundred more fps. At 300 yards, the average fps falls to 2,307fps, right at the same velocity of the .270 Win rounds. At 500 yards, the average for the .243 Win rounds is 1,878fps. The way the lighter rounds bleed off velocity, the average is really only affected at the earlier yard markers. When we look at the individual rounds of each cartridge, minus the lighter .243 rounds, we see quite a bit of overlap rather than a trend of one cartridge having higher velocities. Instead, it is dependent on the individual round rather than the cartridge type. We have also compiled the limit for supersonic flight for each round that we compiled and taken the average for each cartridge. How far a round can remain in supersonic flight is going to carry more weight for those who practice extreme range shooting. It is an important metric because a bullet’s flight is more stable and predictable at these speeds than it is when it falls to subsonic speeds. So for those wanting to shoot at 700+ yards, the ability of the round to remain in supersonic flight makes calculating a shot more manageable, though still impossible for a lot of us. When we look at the supersonic limit, we see that the .270 Win has a higher range average than the .243 Win rounds by a little less than 150 yards. Now, determining if that range is significant and should be a big factor in your decision is up to you. We do see, when looking at the individual rounds, that there are rounds from each cartridge that inhabit the lower and upper ends of that range. There are a couple of .243 rounds that break the 1000 yard mark but there are far more .270 rounds in this range including a few that exceed 1,300 yards of supersonic flight. And even though the majority of the .243 Win rounds fall below supersonic speeds before reaching 1,000 yards, the reality is that with factory loads, this is the extreme range of the rounds anyway. If you are serious about being accurate with these two cartridge at 1,000 yards or more, you’re probably not going to be looking for factory loads to give you the performance you need. When comparing cartridges or just researching one, the ballistic coefficients (BC) are going to pop up at some point. A lot of shooters might have never heard of the term while others give it a lot of credence when selecting a round. In the simplest of terms, the ballistic coefficient is derived from an equation using several bullets and cartridge variables. This number gives you an idea of how streamlined a bullet is. The higher the ballistic coefficient, the better the bullet can resist wind drag and wind drift. A bullet more resistant to these factors is going to be less likely to be pulled off its flight path and theoretically will be a more accurate round. And while long range shooters might have more interest in the BC than hunters, the latter shouldn’t disregard this metric. Depending on the wind strength and the distance, there are a lot of scenarios in the field where a higher BC might be beneficial. A 300-yard shot with 10mph crosswinds is going to carry that bullet several inches off its flightpath. If you can shave off even an inch or two of bullet drift, why wouldn’t you take it? Given this, understanding how two cartridges stack up to each other regarding the BC. We gathered all of the BCs for our selected rounds from the manufacturer and have presented them here in graph form (Graph 4). Just glancing at the graph, we can see that there seems to be a trend towards higher BCs for the .270 rounds compared to the .243 rounds. If you were to average these numbers, you would see that the .270 have a BC around .4 while the .243 has a BC hanging around .3. 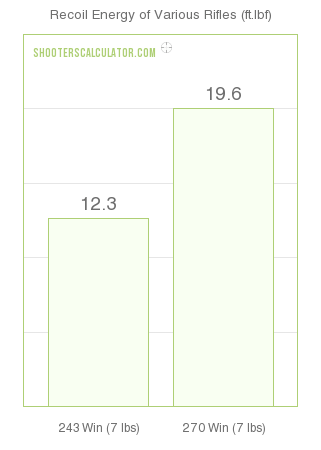 From a ballistic coefficient standpoint, a 0.1 difference is quite dramatic. And when looking at the bullets, it does make sense. Lighter bullets tend to have lower ballistic coefficients as they are more prone to being thrown off by crosswinds and are more susceptible to being caught up in wind drift. You might wonder why lighter bullets would ever be used, but increased velocities and being a little less vulnerable to gravity greatly improve their ballistic performance at least from a trajectory standpoint, when compared to heavier bullets and evens the playing field. Of course, even with lighter bullet weights, they still might not be the best choice depending on environmental conditions and range. And we are talking about a broad comparison of cartridge to cartridge. Just from our selections, you can see that there are some .243 rounds with BCs that stack up a lot better to the .270 rounds. When it comes down to picking a round for use, you’re looking at an individual round rather than a broad cartridge family. To be more secure in saying that the .270 Win rounds are going have higher BCs, we really need to look at more samples which we have done below and also see how the rounds compare when we are not including the sub 60grain .243 rounds. From the larger sample size, we still see that the .270 Win has a pretty significant advantage when it comes to having a higher BC. And again, you have to consider the individual rounds when actually considering what to chamber, but this number does show that there are higher BC options with the .270 when compared to the .243. 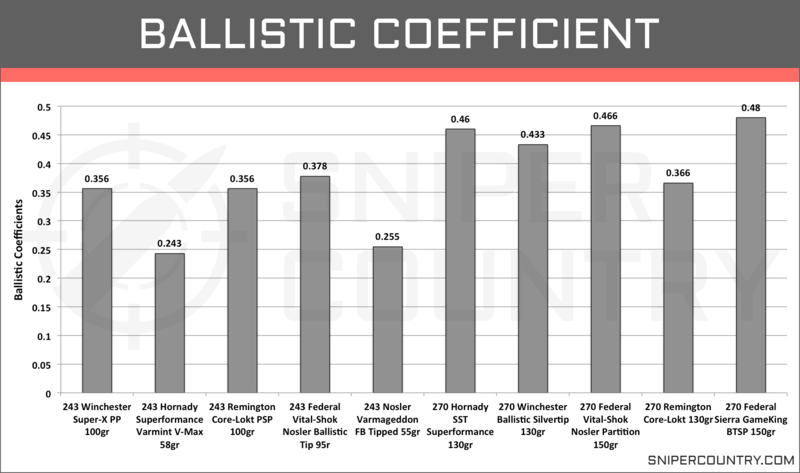 The other major question is if this substantial difference in the ballistic coefficients is still seen when we only examine the .243 rounds that are heavier than the 60grain and lighter rounds and are more comparable to the .270 Win rounds. When we exclude those light rounds, we end up with an average ballistic coefficient of 0.36. While this is a few hundredths higher than what we see above, it’s still a distinct difference from the .270 Win rounds. The trajectory is another ballistic category that gets a lot of attention, especially when comparing two types of cartridges such as the .243 vs .270. Arguments can be heated both in person and online when you start talking about how flat a person’s cartridge of choice flies. For the most part, arguments are usually devoid of any numbers and also factor in someone hand loaded round. In this section, we are just going to look at our selected factory loads and use data that is presented from the manufacturer with 24″ test barrels where stated. Before we dive into looking at the ten selected rounds, we wanted to provide a broad look at thee cartridges trajectory that is a bit less muddled than looking at ten rounds at once (Graph 5). We used an online trajectory calculator to generate the trajectory path, and we selected two rounds, one for each cartridge, which are from the same manufacturer and have the same bullet design. We see that the overall trajectory of these rounds is very similar. The .243 has a slightly flatter arc, but we are only talking about a few inches. We will say that for factory loads, they both do not show too drastic of a drop at 500 yards. Of course, this is only looking at two rounds; we will take a look at a broader selection of our ten rounds for comparison. We will first look at the short range trajectory (Graph 6). We are measuring the bullet drop (inches) from the muzzle out to 300 yards with the test firearms zeroed in at 100 yards. For hunting purposes, this might be the more relevant trajectory information as a vast majority of shots taken in the field will be within and up to 300 yards. Not all of them by any means and we will take a look at short range trajectory soon. What we see with the short range trajectory is that the .243 has several rounds that have extremely flat arcs. The lighter grain bullets tend to be more flat with only a couple inches of bullet drop out to the 200-yard mark and around the 6-10” mark at 300 yards. Even so, both cartridges are relatively flat shooting, especially for factory loads and when compared to other cartridges on the market, the bullet drop is minimal. Most of the rounds group pretty tightly together with only around 1-2” difference at the 200 mark and 2-3” at the 30 mark, excluding the 55 and 58gr .243 rounds. In the grand scheme of things, we don’t think there is enough of a difference to make a decision strictly off of short-range trajectory. In this case, where we see the light .243 rounds excel in this category, it’s important to reiterate that you need to take a lot of different performance specs into account when making any kind of decision. And that is the case for any cartridge or any individual round. While these lightweight .243 rounds are much flatter, they also had low BCs and are going to be more susceptible to wind deflection. If you’re a hunter, you also have to think about stopping power. Like we have said a couple times, there is a lot to interpret when choosing between two cartridges or two rounds of the same cartridge type and unless you have one particular component you are looking for, basing a decision on one performance spec can be a big mistake. Let’s take a look at the short range trajectory of these two cartridges when we include some more rounds. With a larger sample size to draw some conclusions from, we still see that the .243 Win has a slight edge over the .270 Win with less bullet drop. It’s not by much, especially at the 50, 200, and 300 yard mark where the rounds are separated by less than an inch. When extended out to 400 yards, the gap grows to a little over two inches. As with all of our other categories, we also want to look at how these two cartridges compare when we do not include the three lightweight .243 Win rounds just because they deviate a lot from the performance of all the other rounds. When they are excluded, we see the gap close to where these two cartridges are nearly identical. At 200 yards, the .243 Win has an average of 2.8 inches of bullet drop. At 400 yards, the average increases to 26.1 inches of bullet drop. While the .243 Win still has a slightly flatter average, there are flat shooting rounds for each cartridge that will provide the trajectory that you want. For long-range trajectory (Graph 7) we are working with the same units of measurement but are looking at the arc from the 50 yards out to 500 yards with the test rifles zeroed in at 200 yards. For those looking to drive nails at long distances on the range or hunters who typically find themselves in wide open spaces where longer shots are needed, this trajectory might be more relevant to your situation. Like the short range trajectory, we see the flattest arcs with the light grain .243 bullets. Just a note for those who might not be as versed in the shooting sports, while these light weight bullets might have a flat trajectory, they are going to be lacking in the knockout power department. Of course, if you’re shooting targets, it doesn’t matter. For the rest of the yardage marks, we are going to exclude those two rounds; they are flat, we get it. At 300 yards, all of the rounds are tightly clustered around the 6-7” range, not bad for factory loads. As you move out to the 400-yard mark, you will begin to see some distance forming between the rounds. There is a tight cluster of the heavier .243 rounds and the heavier .270 rounds around the 22-23” mark at this range. There are two 130gr .270 rounds with a less pronounced drop, and by that, we only mean a couple of inches, but a couple of inches at 400 yards is pretty significant. At 500 yards, most of the rounds cluster around the 40-45″ mark except for the Hornady Superformance 130gr bullet. In general, there is not a huge difference in trajectory when strictly looking at the two different cartridges. From the .243 and the .270, there are rounds that can provide the distance that you need. For hunters, it all depends on how much power they have once they get there. For target shooters, you will also want to take the ballistic coefficients into the equation. Before we move on to stopping power, let’s take a look at the long range trajectory of these two cartridges with the larger sample size to generate numbers from. We have also extended the range out to a 700 and a 1,000 yard marker for those who like to test the limits of shooting factory loads. If we take a second to look at the averages for these two cartridges, we see a really interesting result. 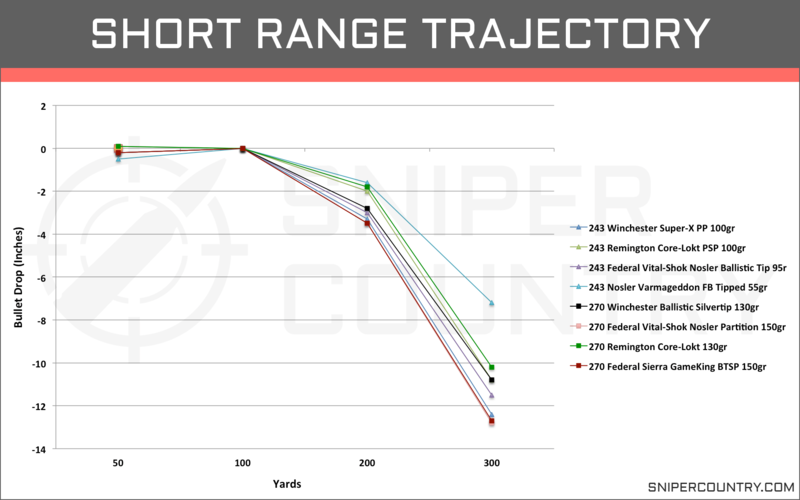 While the .243 Win rounds maintain a flatter trajectory, on average, then the .270 Win rounds through 500 yards, we see the trend flip at the 700 and 1,000 yard mark where the .270 Win has a flatter trajectory at 5.4 inches less bullet drop at 700 yards and 6 inches less bullet drop at 1,000 yards. If we look at the .243 Win average when excluding the lightweight rounds, we see an average bullet drop of 6.7 inches at 300 yards, 20.2 inches at 400 yards, 41.4 inches at 500 yards, 120 inches at 700 yards, and 357 inches at 1000 yards. So, with those flat shooting rounds removed, we see a couple more inches of bullet drop added to the average. It is interesting that we see the bullet drop increase more significantly for the .243 Win rounds as they move out to further distances. This is the same type of trend that we saw when looking at the velocity of these two cartridges as well. While maybe not as significant to those who mainly stick to the firing range, stopping power is a critical performance factor for hunters for several reasons. The first is safety, especially if you are hunting larger predators, coming up on a wounded animal can be a dangerous situation. Secondly, most hunters want enough stopping power to be able to make a clean and humane kill of the animal with causing unneeded suffering. Finally, a clean kill means you are not going to have to track a wounded animal sometimes a couple hundred yards and possibly in the dark. There is not a single number attached to stopping power, besides the number of animals you have harvested with a particular round, but for comparison, no such number exists. For the quantitative factors that we will look at, there are arguments all over the place as to which is the best indicator. In our opinion, any of them on their own does not tell you a whole lot. All of them looked at and considered together are still only part of the picture, but they can give you a lot more information than they would on their own. There are several factors that go into a cartridge’s stopping power such as the kinetic energy carried by the bullet, penetration, and wound creation. You also can never discount your ability to put the round in the breadbasket or the number are not going to mean a dang thing. We will cover the two former categories in this section which includes kinetic energy, sectional density, and bullet momentum. When the powder is ignited, and the bullet sent downrange, the bullet carries kinetic energy with it that is transferred to the target on impact. The mass of the object as well as its acceleration determines the amount of force that the bullet carries. While the amount of energy carried by the bullet downrange is only small part of the equation for stopping power, it is without a critical component. We gathered the energy data from the selected rounds manufacturers website and have compiled them here (Graph 8). We are looking at the force (ft.lbs) from the muzzle to 500 yards downrange. Unlike most of the ballistic properties we have looked as so far, there is a general distinction in stopping power between the .243 and .270 cartridge. Right out of the muzzle, the .270 rounds have nearly 1,000 extra ft.lbs of force on the .243 round. This trend continues out to the 500-yard mark where all of the .243 rounds have well below 1,000ft.lb of force associated with them while the .270 rounds vary between 1,000 to nearly 1,500ft.lb of force. This will obviously be a huge factor in the type of hunting these rounds are suitable for, and we will get back to shortly. 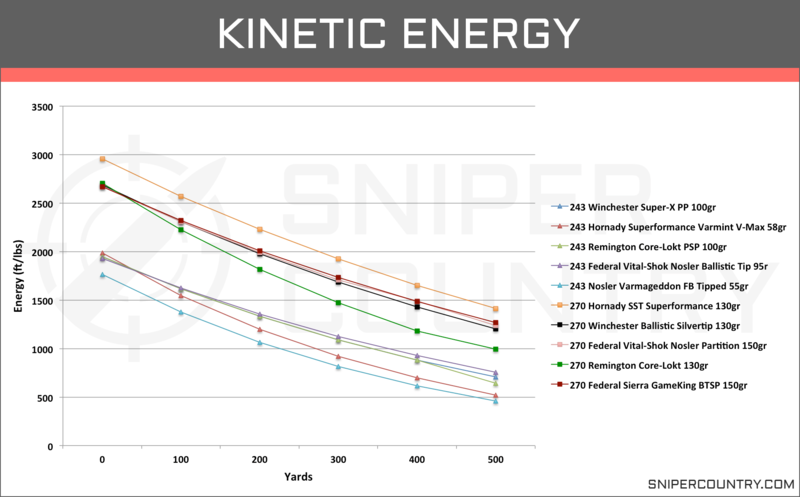 Let’s take a look at the average kinetic energy carried by each cartridge when expanding the field of available rounds. With more rounds, we still see that the .270 Win is carrying a great deal more energy than the .243 Win rounds. Given the kinetic energy is generated from the velocity of the rounds as well as the mass of the projectiles, it is not a surprise that the .270 Win outperforms the .243 Win in this case. And given that, it’s quite possible that the lightweight .243 Win rounds are skewing this data. When they are excluded, we see an average KE of 1945ft.lbs at the muzzle, 1095ft.lbs at 300 yards, and 727ft.lbs at 500 yards. The change is not too drastic at the earlier yard markers because the velocity of these rounds are so high and velocity is actually squared in the equation for KE. As these rounds lose velocity downrange, you can see that they really start to drag down the KE average for the .243 Win. Overall, we are pretty confident in these numbers and they give you an accurate description of how these two cartridges compare in terms of kinetic energy. Like the energy associated with the bullets flight, penetration is another important factor for a round’s overall stopping power. There are several factors that go into how deep a bullet will penetrate. The velocity is one factor as is the bullets design. Bullets that do not expand will penetrate deeply, but not cause as much tissue damage. Fast expanding bullets will cause larger wounds, but might not penetrate down to vital organs of larger game. There is a balance to penetration. While you need the bullet to penetrate deep enough to reach vital organs, you also need the bullet to expand enough to cause enough damage to the surrounding tissue. It’s just something to keep in mind as we examine the potential penetration of these rounds. Another factor that goes into penetration is the sectional density (SD) of the bullet. The sectional density is simply a result of a calculation using the bullets weight and diameter. An example of how SD tells us how two bullets will penetrate is if we have two bullets with the same weight, but different diameters, the smaller diameter localizes the force to a smaller area and gives you deeper penetration. By looking at the sectional density (SD) of the rounds, we can get an idea of how well these different bullets can penetrate and gives us a basis for comparison. We have calculated the sectional densities for the ten rounds we have been comparing throughout the article and put them in graph form (Graph 9). 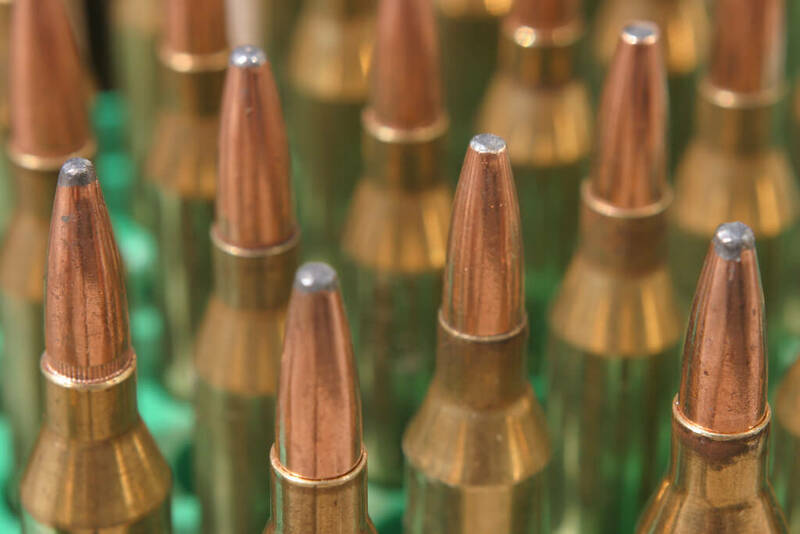 On average, the .270 looks to have a higher sectional density than the .243 rounds, though their average is dropped significantly due to the lightweight 55 and 58gr rounds. The heavier (150gr) .270 rounds have a significantly higher sectional density than the .243 rounds. With the smaller diameter of the .243 rounds, even the 95 and 100gr bullets have a similar sectional density to the heavier 130gr .270 rounds. If you know you’re going to need more penetration for hunting something like muleys, and are for whatever reason stuck between choosing between these two rounds, the heavier .270 rounds are going to be a better option. For anything smaller than that, both the .243 and .270 have plenty of options. And like we have stated previously, penetration is just part of the overall equation to picking a formidable round with plenty of stopping power. 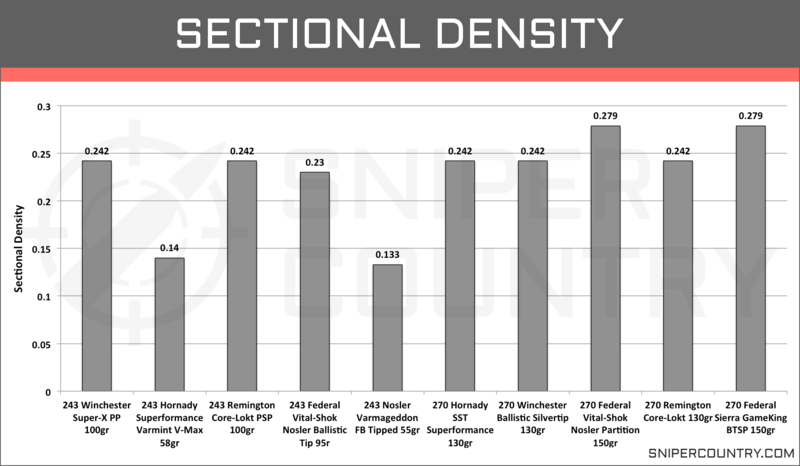 Let’s take a look at the sectional density numbers generated from our expanded round list. Like previously, the .270 Win rounds have a higher sectional density average than the .243 Win round. These two rounds are not to far about when it comes to bullet diameters, but the .270 Win rounds have a higher mass which is going to bump up their sectional density. Given the bullet’s weight is half of the equation for sectional density, we have to factor in how the sub-60grain .243 Win rounds are affecting these numbers. When excluding those rounds, we see an average .243 Win sectional density of 0.222 which is a pretty significant jump in relation to sectional density. Even when not considering the lighter rounds, there is not any overlap between the individual rounds of these two cartridges. While it’s not a complete list, you are going to see higher SDs associated with .270 Win rounds in comparison to .243 Win rounds the vast majority of the time. Bullet momentum is the second metric we will use to compare these two cartridges and their potential penetration. If we remember back to our high school or undergrad physics class, we remember that momentum is the ability for an object in motion to remain in motion. It’s a little indirect, but the higher the momentum of the bullet, the more resistance it can overcome and keep driving forward. We can think of this in terms of penetration. For bigger game that might have thick hide and thick bones, you want a bullet with higher momentum to drive through and allow proper wound creation and a clean pass through. And even that last part has been and is still debated. Do you want a clean pass through, which usually provides better blood trails and conserves meat or do you want full expansion with major damage? We leave that to you, the reader. We have yet to come across any type of guideline for how much momentum is needed for certain game, so this comparison really is just to show any differences between the two cartridges. There are plenty of values that can be calculated which integrate momentum with other factors, but none that look at momentum alone. The actual numbers for centerfire rifles are not as important as you will see with archery because of the properties of bullets. With their speed and shape, these rounds are not going to only penetrate half an inch or bounce off the target. You’re going to get penetration, but does one cartridge have the higher potential penetration? That is what we are really looking at here. We have calculated the momentum data for each of the selected rounds from the muzzle out to 500 yards and graphed them below (Graph 10). The patterns we see from this graph are interesting. The first thing that should jump out to you is that the .270 Win rounds are carrying more momentum than the .243 Win rounds. Even when we remove the two lightweight .243 Win rounds, the .270 rounds are carrying an average of 17lbs/ft.s of momentum at the muzzle and 13lbs/ft.s more at 500 yards. This is a pretty significant difference and it mirrors the distinct differences between these two cartridges that we observed in kinetic energy carried by these cartridges. Let’s take a look at the numbers when we include more rounds and see if we still see the same results between these two cartridges. With more rounds added to the analysis, we still see the same trend of the .270 Win carrying more bullet momentum than the .243 Win. It’s not a surprising result given momentum is just the velocity times the mass of the projectile. We saw similar velocities but generally much heavier rounds for the .270 Win which leads to its advantage in this category. The averages are pretty similar to the averages from the smaller sample size. And while the lightweight .243 rounds do bring down the average slightly, it’s not really impacting the interpretation of how these two cartridges compare to one another. With those rounds excluded from the average, the .243 Win has an average momentum of 40lbs/ft.s at the muzzle, 36.7lbs/ft.s at 100 yards, and 25.6lbs/ft.s at 500 yards. So they are bringing down the average roughly 1lb/ft.s from the numbers in the table. So even when just comparing the average and heavier bullet weights of the .243 Win, we still see a significant increase in bullet momentum with the .270 Win rounds. And of course, we could not have a cartridge comparison without bringing up accuracy. And really, what’s the point of even using a particular cartridge if you can’t put it on target. When it comes to accuracy, the only real measurement is made on the range with shot groupings. Our problem with this, and with any quantifiable measurements of accuracy is that they tend to depend heavily on the firearm, the person handling the weapon, and environmental factors. Still, we can look at some of the other ballistic characteristics we have discussed so far and draw some conclusions regarding accuracy. With the rounds, we have selected for this .243 vs .270 debate, we are confident that anyone with some experience can put these rounds on target within 300 yards. With that being said, there are some caveats to how easy it would be. We saw from the ballistic coefficients that we looked at earlier in the article that the .270 rounds tended to be more resistant to wind drag and drift compared to the .243. Even so, the velocities of the .243 are enough so that the lower BC’s would not hinder performance at ranges these rounds are used for. And we are just talking about the .243 against the .270. Overall, the BCs of the .243 are not that bad. When talking about accuracy, we also have to mention recoil. While recoil might not affect the bullet, per se, it can affect the person doing the shooting. The .243 has extremely low recoil compared to the .270. While most shooters would be able to handle the .270 rounds fairly easily, especially with a little practice, we do think it is much easier to place several consecutive shots in quick succession on target with the .243. It is probably more apparent with younger or more inexperienced marksmen. If you hand load, you could put a little more power into the .270 to help its downrange performance and the same can be said for the .243 Win. In fact, there are still a lot of top notch marksmen that utilize the .243 for long distance competitions. For factory loads, we don’t think there is a huge difference accuracy when looking broadly at the .243 vs .270. When you look at individual rounds and individual users, then there are going to be more distinct differences, especially at ranges out past 300 yards. In today’s market, both .243 and .270 ammunition is pretty easy to get your hands on. While both are fairly popular rounds, you might not find as many different options as you would for the more popular cartridges used for deer and larger game. If you walk into any major retailer that carries ammunition, you are bound to find some of both cartridges, though there is a better chance of not finding the exact round you are looking for. The manufacturers make more of what they are selling more of. It’s simple supply and demand, and the .270 and .243 are just not in as high of demand as other cartridges. Plus, with a number of online vendors, it makes it even easier to find what you are looking for. For prices, we have listed the ten rounds we have used for comparison in this article in the table below. While there are higher priced rounds for each cartridge, the .270 is a few dollars more expensive for a box than .243 ammunition. While it’s your decision, we don’t think it’s enough of a difference to pick one over the other, and the decision should lie with the cartridges performance and how it matches with your situation. Before we wrap up this article, we want to gather all of the information we have covered from recoil to bullet momentum, and use it to get some idea of what situations these cartridges can be used for. Perhaps both cartridges can be used for a lot of situations and perhaps in some situations one cartridge might be better suited. All of this discussion is based strictly off the numbers we have looked at. There are going to be some situations where both can be effective cartridges and personal preference might be the deciding factor. To aid with the discussion, we have included all of the average tables at the end of this section for quick reference if needed. Factory loads of these cartridges are probably not going to be the top picks for long range shooting. Both can be, and are when hand loaded. One of the best marksmen of our generation utilizes the .243 Win. While 1,000 yard shots with these factory loads might be out of the question, both still have the performance for long range shooting in the 500+ yard range. In less than ideal conditions, the .270 Win had more rounds with higher BCs that can help minimize bullet drift due to wind and the .270 also was not too far behind the .243 when it came to trajectory out to 500 yards, though the average .243 Win was a few inches less. 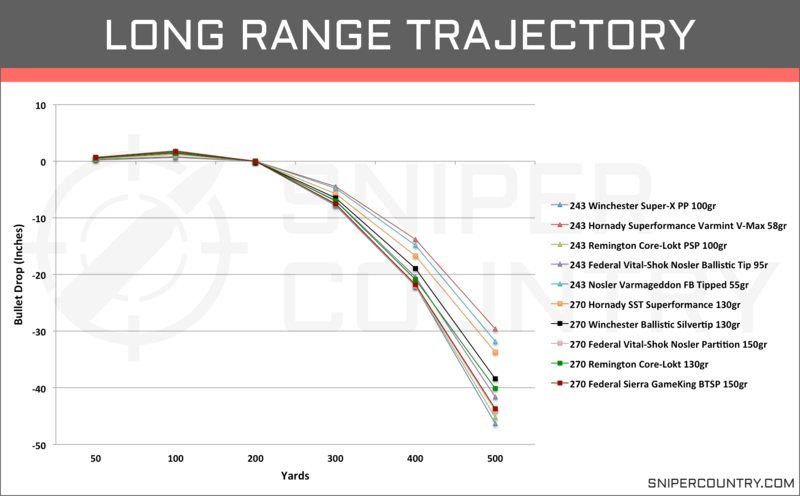 If you’re getting out past that range, the .270 Win actually had a flatter trajectory. They also bled velocity at a lower rate than the .243 Win though we also noted that the sub-60grain .243 Win rounds had a hand it that distinction. For factory loads of these two cartridges, there were certainly more options for higher BCs with the .270 Win rounds, but for average use on the range, the other ballistic specs, especially when looking at individual rounds, didn’t show distinct differences between these two cartridges. Averages might have given us an idea of which cartridge has more rounds with better performance in velocity or trajectory, but when getting down to specific rounds, both cartridges had options that would get the job done on the range. Besides ballistic properties, recoil is also another consideration for range shooting. Though most of us would deny that a little recoil influences our accuracy, the truth is that the anticipation of recoil can change out habits. You should enough shots in a row and recoil fatigue can also cause a decrease in your efficiency. With these two cartridges, the .243 Win produces several less ft.lb of recoil energy than the .270 Win and was one of the only categories where we didn’t see overlap between any of the rounds. The .270 Win certainly isn’t unwieldy and we don’t think its recoil eliminates it from the discussion, but the numbers show there is a clear difference between the two cartridges. When it comes to hunting, both of these cartridges are pretty popular. The .243 Win is a versatile cartridge that has round options for varmint hunting to medium sized game. The .270 Win is also versatile in its own right and can and is used for the same medium sized game as well as larger animals. Both of these cartridges have the trajectory and the BCs to be effective within normal hunting shot distances. Where the differences between these two cartridges, from a hunting perspective, come into play is their stopping power. All of the categories that we looked at such as kinetic energy, sectional density, and bullet momentum showed a clear distinction between these two cartridges. And we don’t say better performance because it’s all relative to what you’re hunting. In these categories, the .270 Win had higher numbers than the .240 Win. For medium game within 300 yards, both of these cartridges carry enough kinetic energy to cause damage. You do see better penetration potential for the .270 Win based on its sectional density and momentum numbers. These, with the higher KE make it a more suitable cartridge for larger game at these ranges. The .270 takes elk size game every year and there are also those who don’t hesitate to use it for moose, though historically, most prefer to go with larger calibers. So, why bother with the .243 Win? We like the .243, especially the lighter rounds for varmint hunting and small predators. And for medium game, where the .270 Win could be used, the .243 is perfectly fine. Two of the best whitetail hunters I know carry the .243 Win and have for years. It is more than capable of medium size game and the light recoil is an added bonus. At short ranges, the .243 Win averages from our rounds had slightly flatter trajectories. Both of these cartridges are popular in the hunting world for a reason. There is a lot of overlap between the performance of these cartridges and also categories where there are clear differences. In a lot of instances, you can’t go wrong going with either the .243 or .270. Recognize what you want out of your hunting cartridge and you will find that either of these cartridges can become one of your favorites. We have one more little component to this section and that is to pick a couple rounds from each cartridge that we have looked at in this article that we think fills a specific shooting niche well. We aren’t saying it’s the absolute best round and all others fall before its greatness. We just like it. Find the round that you are confident with and fits your rifle and run with it. Everyone’s got their go to rounds. In the case that you don’t, this might give you a good place to start. While the best hunting round is going to depend on the type of hunting you are doing, we still want to pick out a round from each cartridge we have discussed. For the .243, we like the Federal Vital-Shok Nosler Ballistic Tip 95gr for deer hunting. It has a great BC, and its trajectory is more than flat enough out to 200 yards without having to make major adjustments to shot placement. From muzzle to 300 yards it is also still carrying over 1,000ft.lbs of force, and the Nosler Ballistic Tip provides more than enough penetration to reach vital organs and expands enough to cause major tissue damage. For the .270 cartridge, it’s hard to beat the Federal Vital-Shok Nosler Partition 150gr round for deer and other medium sized game. The Nosler Partition is a great balance between penetration and expansion, and the 150gr bullet provides a tremendous amount of force on impact with still nearly 1,500ft.lb of force at 400 yards. Out past 300 yards, you will have to rely on your optics to make some adjustments, but that goes for just about any cartridge. If you’re taking shots at 100 yards or less, this round also has the potential to be used on larger game than deer. While neither of these rounds are near the top of the list for long distance shooting, it doesn’t mean they can’t be a lot of fun throwing lead at the shooting range. For the .243 rounds we have covered, the Hornady Superformance Varmint V-Max 58gr are great for a day on the range. They have extremely low recoil, aren’t too expensive, and have a flat trajectory that lets you reach out to 300+ yards. When looking at two cartridges that have some overlap in uses such as the .243 vs .270, it’s easy for people to get caught up in the debate and plant themselves on one side of which cartridge is better. The reality is that both of them suit certain shooting situations better than the other. Some of their performance characteristics might also fit better with some people’s experience and comfort level. It was never our goal to label one cartridge as better than the other. Instead, by laying out the numbers associated with certain ballistic and performance characteristics, we would make it easier for you to determine which one suits the hunting or shooting needs to you have. And as we always try to harp on for all of these articles is that you are not limited to using one cartridge the rest of your life. If you get the chance, get some experience with both and greatly widen your hunting and shooting opportunities.